Not only is this classic recipe delicious, it's also a frugal dish, since it uses inexpensive and flavorful chuck roast. The secret to the dish is to brown the beef very well to get a deep, rich taste. Season the beef very generously with salt and freshly ground black pepper. Add vegetable oil to a large heavy pot or Dutch oven (one that has a tight fitting lid), and set over high heat. When the oil it begins to smoke slightly, add the beef and brown very well. Work in batches if necessary. Once well browned, remove the beef to a bowl with a slotted spoon, leaving the oil and beef drippings in the pot. Lower the heat to medium, and add the onions to the pot; sauté about 5 minutes, or until translucent. Add the flour and cook for 2 minutes, stirring often. Whisk in 1 cup of the beef stock to deglaze the bottom of the pot, scraping up any browned bits caramelized on the bottom. Add the rest of the broth, carrots, celery, ketchup, bay leaf, thyme, rosemary, beef, and 1 teaspoon of salt. Bring back to a gentle simmer, cover, and cook on low for 1 hour. Add potatoes, and simmer covered for another 30 minutes. Remove the cover, turn up the heat to medium, and cook, stirring occasionally, for another 30 minutes, or until the meat and vegetables are tender. This last 30 minutes uncovered is not only to finish the cooking, but also to reduce and thicken the sauce. If the stew gets too thick, adjust with some more stock or water. Turn off heat, taste and adjust seasoning, and let sit for 15 minutes before serving. 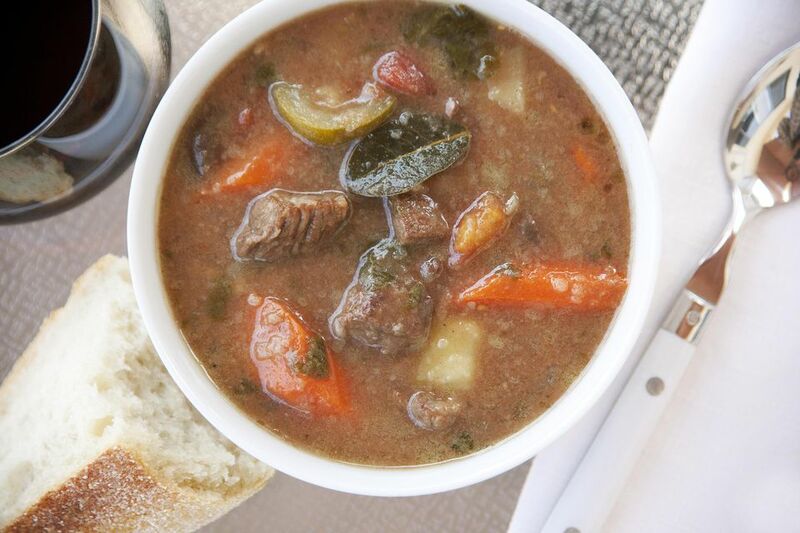 Although it may not seem like it, you can overcook beef stew. the idea of a pot of stew simmering away on the stove all day sounds wonderful, but it the meat will end up dry and the vegetables mushy. the cooking time depends on the quantity you are making, but ideally, it should simmer for 2 to 3 hours.